Asia produces approximately 1.5 trillion bricks per year. The global brick industry is a major source of carbon dioxide (CO2) emissions. Brick kilns are significant emitters of black carbon, which is known to contribute to climate change and local health problems. Black carbon and suspended particulate matter (SPM) are the second-largest contributors to global warming after CO2. More than 2.4 million premature deaths can be attributed to black carbon every year. The collective trend for environmentalist focusing on brick kilns is to reduce the emissions of these brick kilns by moving to cleaner more efficient burning techniques. However at Eiken Co. ltd we prefer to “think outside the box”…we say let’s do away with burning all together thus after exhaustive testing and fields trials in partnership with Asian countries. ECO5000 is mixed with cement and pigment to a slurry. Soil (non-farmland) is mixed with sand in the mixer. The chemical slurry mix is then mixed to the soil/sand mix and further mixed till a homogenous mix is achieved. Brick is then formed as per required size. 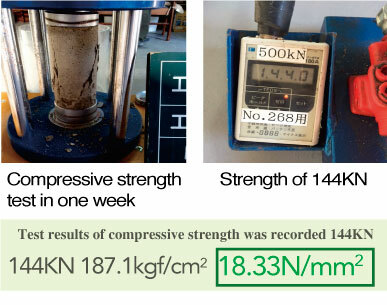 80% strength can be achieved in 3 days with temperature averaging 20 degrees centigrade.